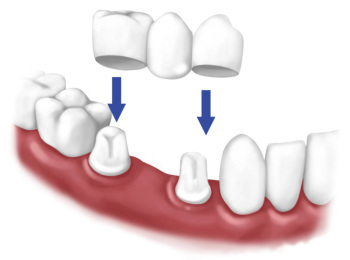 A dental bridge is used to fill in a space left by missing teeth. Bridges can be designed if there are sturdy teeth on either side of the gap to support it. Dental bridges can also be supported by dental implants. Crowns and bridges can be made of all-ceramic materials, gold, semi-precious metal, or a combination to provide the best strength, function and aesthetics for a specific need. Dental bridges provide a permanent, non-removable alternative to full and partial dentures. Bridges can be supported by natural teeth or implants, and can offer natural aesthetics and sturdy chewing surfaces. If you are missing one or more teeth, your dentist can advise you of your many options and discuss the pros and cons of each choice. For both crowns and bridges, your dentist at Dental Arts will shape your teeth to provide ideal support and precise fit of the final restoration. Your dentist will determine color, size and shape of the crown(s) or bridge(s). Then a temporary restoration is secured to protect the tooth or teeth and to allow function while the permanent restoration is being crafted by the ceramics laboratory. At the final visit, the crown(s) or bridge(s) are tried-in to verify fit and aesthetics. Upon approval, the restoration is permanently cemented to the underlying tooth or teeth. A dental crown is used to completely cover a tooth that has become damaged or decayed. When used to restore teeth that show when you speak or smile, they can be a superior cosmetic choice as well as a protective one. Crowns can be made from a variety of dental materials, depending on the specific needs. All-ceramic crowns are a vast improvement over older crowns with metal substructures that were once the only choice. Especially when used on front teeth, all-ceramic crowns can restore a tooth with color and clarity to match your surrounding teeth with no worry about the “gray gum lines” seen years ago with metal-based crowns. All ceramic crowns are used primarily to restore badly-broken teeth, or teeth that have had root canals. In cases where teeth have large, broken-down fillings, a dental crown can protect and preserve the remaining natural tooth. Crowns can also be crafted to match surrounding teeth so well that the crown appears virtually identical to your other teeth. In cases where a tooth has had a root canal, a crown is usually indicated to prevent fracture of the delicate tooth, and to mask the natural discolorations these teeth often develop.